Directions for use: After cleansing face and neck, apply Clarina Anti-Acne Cream on acne lesions and inflamed areas, twice daily, until the lesions have completely healed. We have been able to offer our clients a qualitative range of Clarina Cream. Action: Acne control: Clarina Anti-Acne Cream has antimicrobial, anti-inflammatory, wound-healing, antioxidant, astringent, emollient and soothing properties, which act synergistically in the management of acne. The cream also relieves the burning and itching associated with acne. Pack Size: 50ml, 100ml and 200ml. 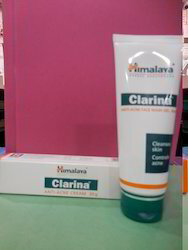 the antibacterial and anti-inflammatory properties of clarina cream help in the control of infection in acne lesions. The cooling, soothing and emollient properties of clarina are useful in relieving burning sensation and pruritus, and in making the skin soft and supple. clarina’s astringent properties relieve inflammatory pain in acne lesions. Clarina also has wound healing properties.